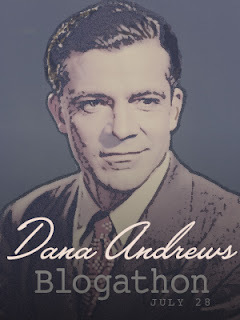 Dana Andrews and the films he made have long been favorites of mine so I was delighted when I found out that Steve Reginald (aka @sreggie) of Classic Movie Man was putting together a Dana Andrews Blogathon. The following is my contribution; see the rest of the excellent posts here. I’ve chosen Boomerang! 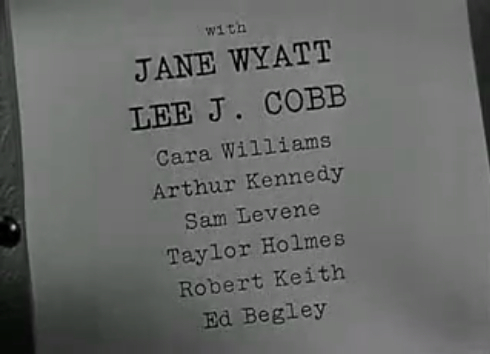 (1947), directed by Elia Kazan. The film is based on an actual case of an innocent man being convicted of murder in Connecticut in 1928 (though the city was changed from Stamford to Bridgeport). Kazan wanted to meld the documentary style of a newsreel with Hollywood moviemaking techniques, and he succeeded — this film is the direct ancestor of the “fact-based” docudramas with which we’re so familiar today. It was supervised by the same producer as the March of Time newsreels, Louis de Rochemont, much of it was shot on the run in real locations, and there’s no score. Despite this, Kazan later expressed dissatisfaction with the film, and with his star. Andrews plays State’s Attorney Henry Harvey, who is based on the DA in the real case. He’s first seen around 10 minutes in, when police chief “Robbie” Robinson (Lee J. Cobb) goes to Harvey’s office to give him an update. It’s clear that the case is already a pressure cooker. The local paper, a property of the reform government’s opposition, is taking the opportunity to make the police, and by extension, the incumbents, look incompetent. Editorials in print and on the radio are agitating the citizenry, neighbors are bickering, and even Harvey’s wife Madge (Jane Wyatt) is after him about the case. It’s no surprise that the shadow side of human nature would begin to dominate. When a “tramp” matching the description is found in Ohio, with a gun of the same caliber that killed the minister, and admitting to having left town when the murderer supposedly would have, he’s arrested and brought back to Connecticut. He’s actually a WWII veteran named Waldron (Arthur Kennedy), who is right out of the Army and can’t find a job. The police torture a confession out of him and the case goes to an inquest, which proceeds as you might expect. Harvey is at first keen to convict Waldron, practically bounding up the stairs to tell the Chief that ballistics says the bullet and the gun match. But before he takes the next step in the process and indicts Waldron, the attorney decides to chat with him in his cell. This scene is when Andrews really begins to shine. He starts out stern, but as he listens to the prisoner’s story — Waldron has had a lot of bad luck after five years in the military — he shows us the faint glimmers of doubt beginning to creep into Harvey’s mind. Something just isn’t right. It soon becomes even more clear that the “authorities” are concerned with something other than justice — staying in office, getting elected, escaping public ridicule — except Harvey. Because when court is in session, and everyone is expecting an indictment, Harvey declares that Waldron is innocent. The rest of the film is a kind of trial, as Harvey recalls witnesses from the inquest and introduces new evidence to prove his statement true, all the while ending his political career. There was very little you could do with Dana….He could learn three pages in five minutes. He had a fantastic memory, even though he’d been up late drinking the night before. He’d come to work, dress up, and we’d roll him out. His style was okay in the movie, because he was playing a lawyer, and essentially there wasn’t supposed to be too much going on inside of him. But unfortunately that kind of acting leaves you with the feeling that there was nothing really personal at stake. This film isn’t on DVD, and Fox pulled most of it down from YouTube (hence the mediocre screenshots), so keep an eye for it on TCM. 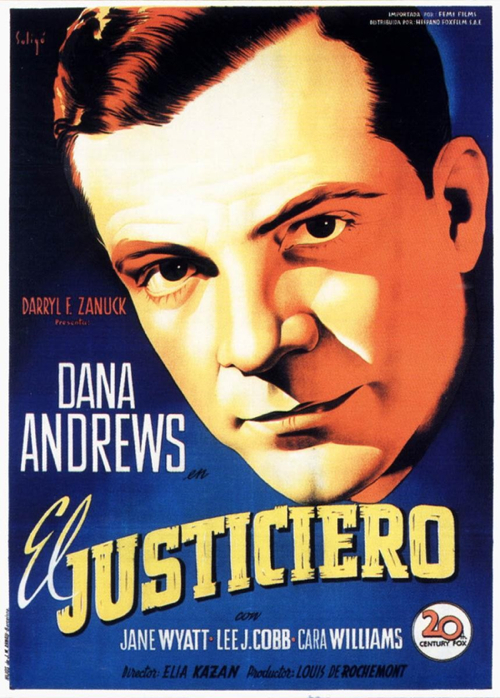 You don’t want to miss one of Dana Andrews’ best performances. UPDATE: Boomerang! is actually available from ClassicFlix or via Amazon. You could do a lot worse than buying this film. Thanks Stephen! 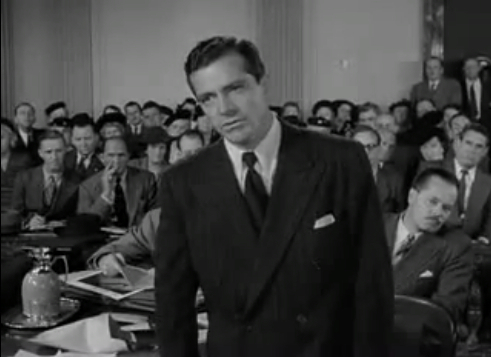 Posted on 28 July 2012 by PaulaPosted in FeaturesTagged 1940s, blog events, blogathon, dana andrews, elia kazan. He’s so great in this truly underrated Kazan film. Fine review of an interesting film. Kazan was also disdainful of his cast, including Dorothy McGuire and Oscar-winner James Dunn, and the final product of “A Tree Grows in Brooklyn.” As you say, one wonders if he was watching the same film. Yep, he seems to have a really cranky guy LOL It’s odd that he directed quite a few actors in Oscar-nominated performances, occasionally those very actors he disparaged. Paula, I agree with your take on the film. Kazan is just plain wrong–as I try to show in my biography of Dana. Boomerang–like The Purple Heart and A Walk in the Sun–brings out a certainly nobility in Dana’s character and in the man himself. Norman Lloyd said to me, “Dana was one of nature’s nobleman.” And in another note, Lloyd called him a “prince among men.” When Dana made Boomerang he knew a lot more about making motion pictures than Eliza Kazan did. If Dana was unresponsive, I suspect it is because he did not want to offend Kazan and just wanted to do his work. Dana never put up a fuss on movie sets even when the directors were horse’s asses. Kazan has a huge rep, but what critics forget is that he was still pretty new at moviemaking when he worked on Boomerang. How cool that you’ve been in contact with someone that worked with the man himself! I always got that impression of him, that he saved the drama for when the camera was rolling. It’s nice to have my impression confirmed 🙂 I think you raise an important point, that Andrews was such a professional, and Kazan was relatively new to films, would have been a source of conflict. I also think that maybe the difference between film and theatre acting was also part of why they didn’t get along. Every time I see a live theatre production, I realize how much more subtle film acting is. Paula, thanks so much for taking part in the blogathon. This is an insightful post on a very good movie from a legendary director early in his career. Why he wasn’t able to appreciate this film or Dana’s performance is one of those mysteries in the annals of movie history. Love the courtroom scene with the gun; it takes your breath away. Great job! You’re so welcome Steve, thank you for asking me to write! I can’t figure Kazan’s disdain…in my research, I came across a couple sources that speculated that he held the film and Andrews’ performance in low esteem because it was a early work for the director. At any rate, it’s unfortunate that he felt that way. And yeah…the gun scene…it always gets me, even though I’ve seen it before. Gee, I’ve never heard of this one…..sounds like a goodie. Wasn’t Kazan the one who turned people over to the mob who were blacklisting people? McCarthy? Was he implying Dana was a heavy drinker? I didn’t know that either. We’ve been watching some good ones lately. The Big Sleep, They Died with their boots on, etc. Great stuff. It is a goodie, Val! Like I said, it’s not on DVD, so we have to watch for it on TCM. Kazan had been a member of the Communist Party in the mid-’30s and was called before the House Committee on UnAmerican Activities in 1952. At first he refused to name anyone else he knew in the party but then he did give them the names of 8 people who’d been in it with him. All the names were already known to HUAC but the fact that he even gave the names made him pretty unpopular in Hollywood. I don’t think he was implying it…he came out and said it 😉 I’ve never heard that and I think anything that Kazan says about Andrews is suspect…there’s no love lost there. Paula, according to Amazon.com, Boomerang! is available on DVD. I have a copy of it myself. I know there was some problems with the rights to it when first announced for released. Fox pulled it back for several months and it was priced pretty high compared to other Fox films from that period. But it’s now available. The DVD has a good audio commentary by film historians Alain Silver and James Ursini. The DVD transfer is very good as well. The B & W cinematography looks terrific. Wow, by the quality of the movie, I would never have guessed that there was tension between the director and Andrews. I personally love Andrews’ acting style. He has this stillness that draws you in. You want to know what he’s thinking. Thanks, I agree! I think he’s always interesting, and most of the time, downright riveting, precisely because he’s so subtle. Carl Rollyson says it best below I think, Andrews was a pro and would have kept the conflict with Kazan from affecting his work. Hi! apologies for taking so long to get here but there was just so much good stuff in this blogathon I had to pace myself! so glad this blogathon introduced me to you and a few other new-to-me bloggers/movie buffs, very nice writing. I saw this one a few years ago but need to refresh my memory of it now. It’s great you point out that scene of Andrews listening to Kennedy, because somewhere while reading up on Fallen Angel (or maybe from the dvd commentary? Can’t recall) someone mentioned how great Andrews was at listening in a scene, being totally present and involved, which of course is such a big part of his charm on screen. Possibly another angle to Kazan’s disappointment was that after Zanuck saw an early cut, he blasted the story, development and continuity etc and ordered a change in the plot to NOT show the killer from the start; he thought that otherwise, Andrews and the police looked too dumb and the movie lacked suspense. Cheers! I thought Dana was completely solid and very real in his role. I am quite surprised by Mr. Kazan’s feelings about him. What I appreciated most about the film was the integrity of Dana’s character. In an age when there is SO much political corruption, I appreciate that he wasn’t willing to bow to the political machine and, instead, put doing right above his desire to rise on the political ladder. I don’t know where my reply to your comment went, Patti! I changed the post to reflect that there is a DVD available, obviously I was wrong there. Andrews represented complete integrity, a quality that was rare back then and is nearly non-existent now. Man another one i havent seen! Im so excited to have all these new films to track down from all these great posts. I still stand by my comparison of Andrews to Buster Keaton, you dont always have to leave an emotional puddle to get the point across, thats why he was good at these kind of roles. That’s an interesting comparison for sure, I never thought of that! Keaton certainly is subtle. I’ve not seen as many of his films as I have Andrews’, but I will keep an eye out in future. Love this film. I did a write up about this many years ago; I will have to pull it up and add it to my site one day. Thanks for reminding me about this gem! Happy to help, I too think it is a gem 🙂 Looking forward to reading your post. It’s interesting that you should say that. I just recently watched “LAURA”. And I noticed in one scene in which the Waldo Lyedecker character was reliving his memories of Laura Hunt with Mark McPherson that Andrews seemed to project this image of being really interested in what Clifton Webb had to say. This was the first time that I noticed this. So glad you noticed this! The other thing I’ve noticed since I originally wrote this is is that he lets you see him breathe. I’m beginning to think that is one of the key signs of great natural acting. Andrews is really quite underrated.